The modern Eftelya Apartments boasts one of the best locations in Fethiye, Turkey. The apartments are split between two separate blocks and are surrounded by beautiful landscaped gardens. 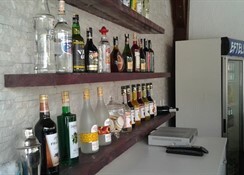 The friendly owners provide a relaxing and fun atmosphere for their guests. All apartments are air-conditioned and have a kitchenette, a living area and a wet room style bathroom. Onsite facilities include an outdoor swimming pool, a sun terrace furnished with loungers and parasols and a poolside snack bar. 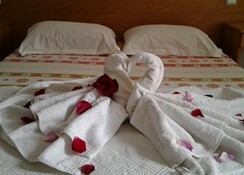 Other facilities available to guest are currency exchange, internet access, safety deposit box and satellite TV. These apartments are the right choice for couple, families and groups of friends who seek a friendly and fun atmosphere in a complex which boasts a beautiful setting. These apartments have an outdoor swimming pool onsite. The pool is surrounded by a spacious sun terrace furnished with loungers and parasols. The complex also features a poolside snack bar. This complex has a choice of one and two bedroom modern apartments all with pool-view balconies. The one bedroom apartments sleep up to 4 adults while the two bedroom apartment can accommodate up to 6 people. All apartments are air-conditioned and are equipped with a wet room style bathroom, a fully equipped kitchenette and a living area. There is a poolside snack bar serving an a la carte menu located onsite. The Eftelya complex is ideally situated on the outskirts of Babadag. 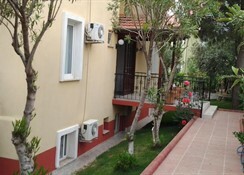 The local resort of Hisaronu with all its attractions and amenities is only a short bus ride away from these apartments. Also easily accessible by public transport is the beautiful blue lagoon situated in neighbouring Olu Deniz, approximately 3km away. 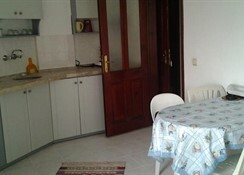 The friendly owners at the Eftelya apartments are happy to assist you with any transport or tourist enquires.